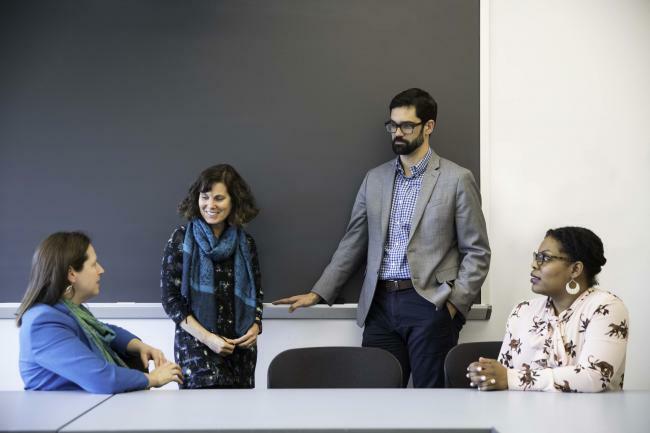 Penn GSE recently launched an exciting new initiative that grounds three of its renowned teacher education programs in the Collaboratory – a laboratory for the design, implementation, and study of experimental approaches to teacher education. The new initiative houses three unique teacher education programs, ongoing teacher development, and ramped up and inter-woven research on teacher education. The Collaboratory kicked off with an April panel discussion entitled “Deepening Teacher Learning Across the Professional Continuum,” moderated by Dean Pam Grossman and featuring Vincent Cobb II (CEO & Co-founder, The Fellowship: Black Male Educators for Social Justice), Sarah Schneider Kavanagh (Research Assistant Professor, Penn GSE), Meredith Mehra (Deputy Chief, Office of Teaching & Learning, The School District of Philadelphia), and AJ Schiera (Social Studies Teacher & Department Chair, Sayre High School). The three teacher preparation programs under the Collaboratory banner provide multiple pathways to excellence in teaching. All three programs offer an M.S.Ed. and have been invigorated with new leadership and visions. The Collaboratory is also a growing hub for ongoing learning and engagement for teachers, teacher educators, and teacher education researchers. The initiative offers a suite of ongoing professional development programs in computational thinking, project-based learning, and virtual online teaching, as well as Special Education certification. The roster of additional Penn GSE certificate programs is expected to grow in the coming years as part of the school’s commitment to life-long teacher development. An ambitious Collaboratory research agenda, which will deeply inform the degree and certificate programs, will be announced later this year.